It’s been a few years since I went on a fast – for spiritual, or health reasons, but being the daughter of an alternative medicine proponent and holistic health practitioner (my mother), I have been inspired to do, or directed to do many fasts over my adult life – from water fasts, to juice fasts, to master cleansing, you name it, I have tried it (one involved drinking only sauerkraut juice – not my favorite memory). Fasting for spiritual purposes is different, in my opinion, from fasting for nutritional purposes. I remember the first time that I was told that you should use the “extra time” that you are not eating to pray, or contemplate and meditate, or to help others less fortunate. That is, not just “not eating”- but replacing that time you would be eating, preparing to eat, or cleaning up from a meal to do something to strengthen your spiritual self. 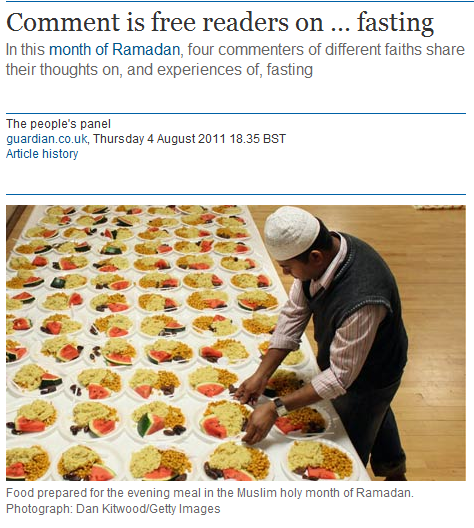 To read the rest of the article, visit: http://www.guardian.co.uk/commentisfree/2011/aug/04/peoples-panel-ramadan-fasting .